A Shift Toward Prey, Chronicles of the Fringe, is an intense and highly charged story of two sisters who are shifters in the land of the Fringe. Chiari’s sister, Huntress Rehyani, is leader of the regime. She wields power with heavy-handed control to effectively force the other realms to do her bidding. But when Rehyani seems bent on ending a long-standing truce with the vampires of the Everdark, Chiari knows something must be done before her people are destroyed. Conspiracy lurks within the depths of the driving forces behind the ensuing war and Chiari soon learns loyalty is a rare commodity. She will need to remain guarded to avoid betrayal. Nonetheless she forces herself to take brave risks as she assembles a team of allies to lead a revolution and ultimately restore peace to her land. 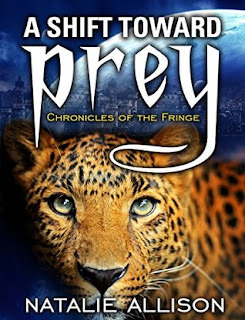 Natalie Allison’s A Shift Toward Prey, is a dramatic work of fantasy fiction which captures readers from the very first highly-charged scene clear through to its resounding finish. With multi-faceted characters which nearly leap off the pages, and a protagonist who will have readers cheering for her success, this winning book is entirely enthralling and nearly impossible to put down. A Shift Toward Prey, is recommended for home and school libraries and has earned the Literary Classics Seal of Approval.